Khalil Gibran (born Gibran Khalil Gibran, Arabic: جبران خليل جبران, Syriac: ܓ̰ܒܪܢ ܚܠܝܠ ܓ̰ܒܪܢ) (January 6, 1883 – April 10, 1931) was an artist, poet and writer. He was born in Lebanon and spent much of his productive life in the United States. He is best known for his book of essays, The Prophet, which achieved a cult-like status in the U.S. Gibran's work, which blended Christianity with Middle Eastern spirituality, particularly that of `Abdu'l-Bahá, which struck a chord with many young people in the aftermath of the turbulent 1960s. According to his relative of the same name, the Gibran family's origins are obscure. Though his mother was the "offspring of a priestly, and important family," the Gibran clan was "small and undistinguished." He was born in the Maronite town of Bsharri in northern Lebanon, and grew up in the region of Bsharri. As a result of his family's poverty, Gibran did not receive any formal schooling during his youth in Lebanon. However, priests visited him regularly and taught him about the Bible, as well as the Syriac and Arabic languages. During these early days, Gibran began developing ideas that would later form some of his major works. In particular, he conceived of The Prophet at this time. After Gibran's father went to prison for fraud and tax evasion, Ottoman authorities confiscated his family's property. Authorities released Gibran's father in 1894, but the family had by then lost their home. Gibran's mother, Kamilah, decided to follow Gibran's uncle and emigrate to the United States. Gibran's father chose to remain in Lebanon. Gibran's mother, along with Khalil, his younger sisters Mariana and Sultana, and his half-brother Peter (a.k.a. Butros) left for New York on June 25, 1895. Kahlil Gibran with leopard skin and staff, seated, photograph by Fred Holland Day, 1898. At the time the second largest Lebanese-American community was in Boston's South End, so the Gibrans decided to settle there. His mother began working as a peddler to bring in money for the family, and Gibran started school on September 30, 1895. Since he had had no formal schooling in Lebanon, school officials placed him in a special class for immigrants to learn English. Gibran's English teacher suggested that he Anglicize the spelling of his name in order to make it more acceptable to American society. Kahlil Gibran was the result. 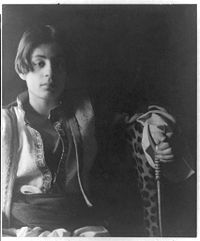 In his early teens, the artistry of Gibran's drawings caught the eye of his teachers and he was introduced to the avant-garde Boston artist, photographer, and publisher Fred Holland Day, who encouraged and supported Gibran in his creative endeavors. A publisher used some of Gibran's drawings for book covers in 1898, and Gibran held his first art exhibition in 1904 in Boston. During this exhibition, Gibran met Mary Elizabeth Haskell, a respected headmistress ten years his senior. The two formed an important friendship that lasted the rest of Gibran's life. Haskell influenced not only Gibran's personal life, but also his career. In 1908, Gibran went to study art with Auguste Rodin in Paris for two years. This is where he met his art study partner and lifelong friend Youssef Howayek. He later studied art in Boston. While most of Gibran's early writing was in Arabic, most of his work published after 1918 was in English. Gibran also took part in the New York Pen League, also known as Al-Mahjar ("immigrant poets"), alongside other important Arab American authors Ameen Rihani ("the father of Arab American literature"), Mikhail Naimy and Elia Abu Madi. Much of Gibran's writings deal with Christianity, mostly condemning the corrupt practices of the Eastern churches and their clergies during that era. His poetry is notable for its use of formal language, as well as insights on topics of life using spiritual terms. Gibran's best-known work is The Prophet, a book composed of 26 poetic essays. During the 1960s, The Prophet became especially popular with the American counterculture and New Age movements. The Prophet remains famous to this day, with passages often read at weddings and christenings. One of his most famous lines of poetry in the English speaking world is from 'Sand and Foam' (1926), which reads: 'Half of what I say is meaningless, but I say it so that the other half may reach you'. This was taken by John Lennon and placed, though in a slightly altered form, into the song "Julia" from The Beatles' 1968 album The Beatles (a.k.a. "The White Album"). Gibran's most famous line of all is that which inspired John F. Kennedy's oft quoted "Ask Not What Your Country Can Do For You," from his 1961 inaugural address. The quote was inspired by a 1925 article, "The New Frontier," in which Gibran wrote: "Are you a politician asking what your country can do for you or a zealous one asking what you can do for your country? If you are the first, then you are a parasite; if the second, then you are an oasis in a desert." Juliet Thompson, one of Khalil Gibran's acquaintances, said that Gibran told her that he thought of `Abdu'l-Bahá, the divine leader of the Bahá'í Faith in his lifetime, all the way through writing The Prophet. `Abdu'l-Bahá's personage also influenced Jesus, The Son of Man, another book by Gibran. It is certain that Gibran did two portraits of him during this period. 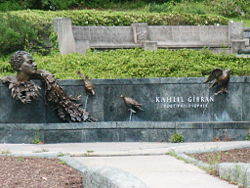 Kahlil Gibran memorial in Washington, D.C. The Gibran Museum and Gibran's final resting place, located in Bsharri, Lebanon. Gibran died in New York City on April 10, 1931; the cause was determined to be cirrhosis of the liver and tuberculosis. Before his death, Gibran expressed the wish that he be buried in Lebanon. This wish was fulfilled in 1932, when Mary Haskell and his sister Mariana purchased the Mar Sarkis Monastery in Lebanon. Gibran remains the most popular Lebanese-American writer ever. The Prophet is a book of 26 poetic essays written in 1923. In the book, the prophet Almustafa, who has lived in the foreign city of Orphalese for 12 years, is about to board a ship which will carry him home. He is stopped by a group of people, who prevail upon him to discuss his insights on the many mysteries of life and the human condition. The book is divided into chapters dealing with the gamut of human life: love, marriage, children, giving, eating and drinking, work, joy and sorrow, houses, clothes, buying and selling, crime and punishment, laws, freedom, reason and passion, pain, self-knowledge, teaching, friendship, talking, time, good and evil, prayer, pleasure, beauty, religion, and death. One of Gibran's best known works, the book achieved a cult following among American young people. He followed it with a sequel, the Garden of Prophet, and was due to produce a third part when he died. ↑ Bahai Faith Retrieved December 23, 2007. On Children, a poem by Kahlil Gibran with animation and sound From Geometry from the Land of the Incas. This page was last modified on 16 April 2018, at 16:20.